Great looking, simple cupcakes for any occasion! 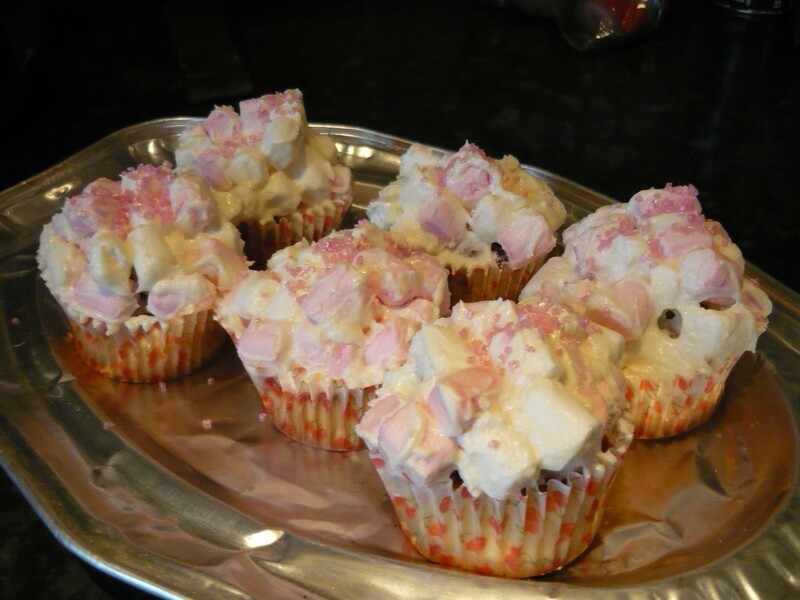 Made these a few times - Always get a good reaction...very moreish! The original recipe has marshmallow centers but it can be quite fiddley, so i usually leave that out and just have marshmallow frosting. Have included recipe for Vanilla Frosting further down or this could be purchased if your wanting to make this quicker. Pre heat your oven to 170oC (325oF) Gas mark 3. Put flour, sugar, baking powder, salt and butter in a bowl. Original recipe says to use freestanding or hand mixer to combine, but i prefer to rub butter into dry ingredients - less mess. Either way you need a sandy consistancy when done. Gradually pour in half the milk and beat with mixer untill just incorporated. Whisk egg,vanilla and remaining milk together and then add to the flour mixture. Mix until smooth. Spoon mixture in to paper cases - 2/3 full and bake for 20 -25 minutes until golden brown. When baked leave to cool on a wire rack. I like to make frosting whilst my cupcakes are baking so you'll need. *Beat icing sugar and butter in a bowl with a hand mixer unit well incorporated. *Combine milk and vanilla together in a jug, then gradually add to the icing sugar, whisking all the time on a medium setting. *When all the milk is combined, continue to whisk on a higher setting until light and fluffy. *A few drops of colour may be added if you wish. When the cakes a cool - top with plenty of marshmallow frosting. I have the same problem with publishing. Sometimes it decides to delete some of my "things you need". Thanks for the correction. I will have to make these soon. Just realised is missing half the ingredients too! Sorry guys am totally new to this and have a feeling my rubbish internet signal is to blame (this is the 3rd attempt at this comment!) Missing items below. sorry guys totally new to this and have a feeling it could be due to my rubbish internet signal! argggh and only half of the ingredients! Ive just noticed steps 4 and 5 are the wrong way round!! unsure if i can edit at this stage so apologies!